You've got a sparkly refrigerator and a spotless pantry. 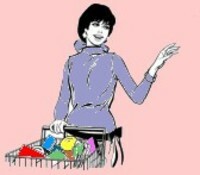 Today you are going to go through them and make note of anything you need to restock and take yourself shopping! Remember: fresh is best, frozen next when it comes to produce. Look for vibrant color and absence of blemishes. Be sure to check expiration dates on all purchases. Ask the butcher about the cuts of meat and choose those that look the brightest, firmest, and most marbled for meats. The fishmonger can direct you to the freshest fish and recommend a new way to prepare it, too! Steer clear of processed foods, but don't ignore aisles with the dried pastas. Even though fresh pasta is wonderful, it's nice to keep a box of spaghettini or farfelle on hand for a quick pantry meal. While making your list, consult your cookbooks, recipe cards, and your weekly menu if you have one (I highly recommend it!). This way you are sure to purchase all of the items you need. But don't forget to take the list with you! You may also want to check if you have any manufacturer or store coupons. This may help you decide where to shop. Many stores offer double coupons on Wednesday. With the money you save grocery shopping, you can go get a manicure tomorrow!